One of the cool things about working at Mozilla is you get to help more than just yourself or your boss or your company… sometimes you get to help the community. PyLadies is a mentorship group with a focus on helping more women become active participants and leaders in the Python open-source community. Following the pattern of groups like Ubuntu Women and PHP Women, PyLadies aims to provide a friendly support network for women and a bridge to the larger Python world. Both men and women are encouraged to participate. PyLadies requested sponsorship to help more women attend DjangoCon and it felt like a good thing for the Python community. We helped send 8 women to DjangoCon – female Django developers who would not have otherwise attended (and in some cases presented) at the conference. The results have been amazing. 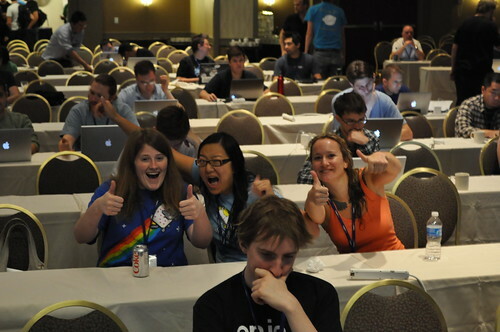 Some of the women who attended on the grant gave talks for their first time, while others are now inspired to submit talk proposals to PyCon 2012. Here are details on how the money was spent. Building the open web isn’t just about using and producing open source software; it’s also about building an open and welcoming community. Dave is a Senior Web Developer at Mozilla. He works on Firefox Input, Mozillians, Playdoh and Elastic Search.